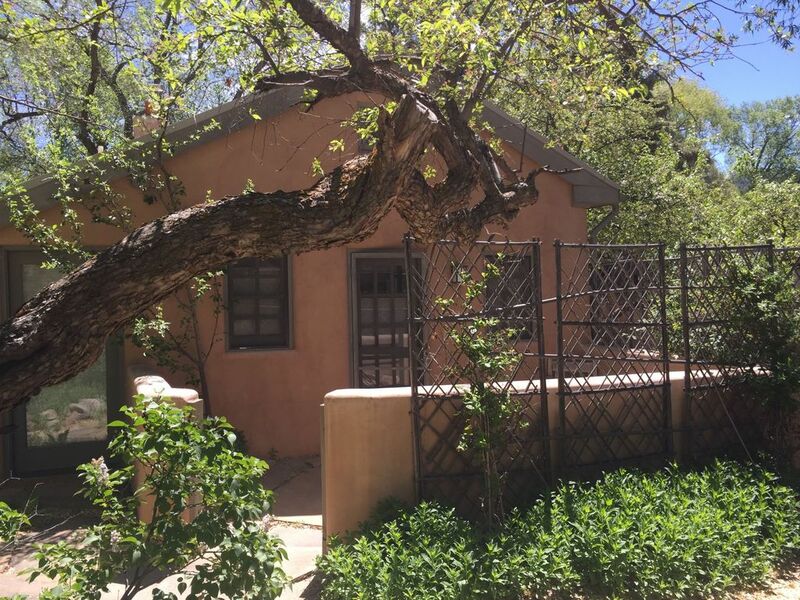 Beautiful, private, adobe-style guest house nestled in the lush, green, Santa Fe River valley on the Historic East Side in the residential area of Canyon Road ½ mile from the Audubon Center. Steps from walking trails along the river and hiking trails in the Santa Fe National Forest, and less than five minutes by car to the art galleries of Canyon Road, and 1.7 miles to the Plaza. Spacious and comfortable (almost 1000 square feet) with a pitched roof and skylight, the casita is decorated in a chic but warm style that blends contemporary and antique pieces with photographs and prints from the owner’s collection of work by New Mexico artists. It includes a working kiva fireplace made from river rock in the corner of the open-style great room that contains two comfortable sofas, a broad counter with two tall chairs facing the well-appointed kitchen, a wide dining table that seats 6, and French doors that lead to the completely-fenced, private outdoor area. An open-style armoire in the living area contains a flat-screen TV along with a selected library from the collection of the owner, who is a book publisher. The lovely bedroom has a queen-sized bed with ample linens and blankets; a comfortable wingback chair for reading; a generous, walk-in closet; bath with large tub, shower, and double sinks; and, just outside another set of French doors, a patio complete with gas grill, dining table, Adirondack chairs, shade trees, and a small garden where you can sit and enjoy the sun winter and summer. Amenities include: washer/dryer, dishwasher, full-sized refrigerator and oven, microwave, Bose sound system, wifi, cable TV, roomy washer/dryer/counter/storage area just off the kitchen, ceiling fan in bedroom (no AC needed in this part of town), and radiant heat throughout for complete year-round comfort, plus ample parking for two cars. Luxurious soaps and lotion are provided from the lavender gardens of the famous Los Poblanos historic, organic farm. The house sits on the edge of a larger property that straddles the river with more than an acre of land full of old poplar, willow, ponderosa pine, and fruit trees, with natural grasses and wildflowers throughout. It was once part of a large estate that still only has 3 houses on our side of the river. The pictures show both the car and foot crossing, and the river trail, which you can walk to the galleries and restaurants of Canyon Road; it takes 30-40 minutes depending on how far you decide to go. The casita is a rare gem in a city full of enchanting properties. It offers the best of all possible worlds in this sophisticated, yet welcoming small city that is one of the most unique in the United States. Being from Connecticut, I was immediately smitten with this property when I drove down the driveway and saw the river and the old poplar trees; it's so rare and wonderful to be on the water in the desert. I also like to be close to everything and this place is perfect as it's a short hike to the restaurants and galleries of Canyon Road and a short drive to Museum Hill, the Botanical Gardens, or the Plaza. Radiant heat; ceiling fan in bedroom. You don't need A/C here in the canyon; most houses don't even have it. House stays very cool in the summer and warm in the winter. Long term--30 days or more--renters preferred, but will consider 2 weeks. Rates are subject to change until booking is confirmed. Cleaning and restocking fee is a one-time fee; interim cleaning for stays of longer than 30 days can be arranged with owner.